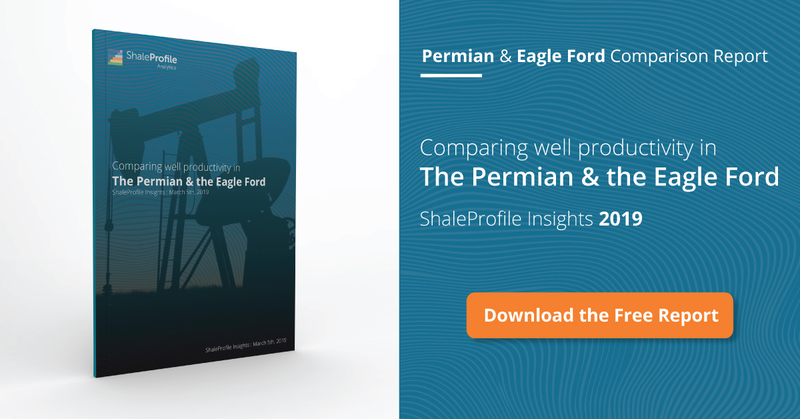 This interactive presentation contains the latest oil & gas production data from 10323 selected horizontal wells in the Permian (Texas & New Mexico) through September. This total production overview shows how oil production has increased in the Permian over the last couple of years. In 2016 this growth has slowed, but not reversed, like in the other basins. The apparent drop in September is caused by missing new well data; once revisions come in I estimate that also in September production has grown somewhat. I’ve selected to show this production by the quarter in which wells started production, as it visualizes the underlying decline in a bit more detail. As noted in my previous Permian update, if you switch to gas (using the “product” selection in the top right), you’ll see that gas production has risen faster than oil production in 2016. In the “Well quality” overview, we can see the average production rate of all these wells over time, grouped by the year in which they started. The number of new completions in the first 3 quarters of 2016 was about 1/3rd lower than in the same period of 2015. The average well performance has increased, as you can see in these graphs. Part of this improvement was caused by reduced drilling in the fringes, as can be seen in the lower performance improvements if you check individual counties. The “Well status” overview shows how the number of new completions has slowed down during the past 2 years. This slowdown was clearly less steep than in the Eagle Ford, and the Bakken. I attribute the apparent drop in completions in September to incomplete data. This first overview shows how all these horizontal wells progress towards their ultimate recovery, as their production rate slows down. The wells are grouped by the quarter in which they started production (“first flow”). The improvements in especially initial production during the last few years are clearly visible here. Given the regular behavior of these wells, I belief that this overview allows one to make reasonable estimates of ultimate recovery for these wells. By switching to gas, the same can be done for ultimate gas recovery as well. More overviews are available here if you want to explore the production and well productivity in this basin in more depth. Coming Monday I will have another update on the Niobrara. Texas RRC. I’ve estimated individual well production from well status & lease production data, as these are otherwise not provided. Because of these estimations, I recommend looking at larger samples (>50 wells) before drawing conclusions. About 7% of the horizontal Permian wells in Texas are excluded, as these were mixed with too many vertical wells on a lease, making reasonable well profile estimations impossible. I’ve no spud, DUC, or plugging information on wells & DUCs in Texas, so these statuses are unavailable. Detailed location data is available for all New Mexico wells, and for almost 95% of the Texan wells displayed; the remaining wells are shown near the center of the county in which they are located. Formation data in Texas is only available on lease level; therefore in cases where wells on the same lease are drilled in different formations, this information is not accurate. Is there any way you could change your top GOR graph in the advanced insights tab to the equivalent x axis of “months on production” as your well performance tab in the top section. I am trying to compare GOR behavior to published model results, and for the same reason as you outlined to nuassembly a calendar date when new wells are being added continously does not show much technically. Thanks for the suggestion. I’ll think a little more about this, but my first thought is that I agree with you. I’ll make a decision next week, before posting new updates. In the mean-time, I suggest using the selection “Show gas oil ratio by”, and then choose year or quarter of first flow (but you still have a little of the effect of changing well population). An alternative is to look at both the oil, and gas production separately, in the “Well quality” tab, and then calculate the Gas Oil Ratio yourself for the relevant points. It is really helpful for the layman! Is it possible that the EUR’s of 2016 wells will still only reach 160k barrels and not 1 million barrels for the Permian wells from CWEI and others like Bass’s, but that the super fast extraction (with long laterals, tons of sand and multi-well/pad) will increase the NPV’s dramatically, thus justifying these very high prices as measured by $/flowing boe? Great to hear that Joel! > Is it possible that the EUR’s of 2016 wells will still only reach 160k barrels and not 1 million barrels for the Permian wells from CWEI and others like Bass’s, but that the super fast extraction (with long laterals, tons of sand and multi-well/pad) will increase the NPV’s dramatically, thus justifying these very high prices as measured by $/flowing boe? I hope that based on these numbers, readers will have the info they need to start working on answering the kind of questions you just posed. Sorry, can’t help you much more than this. You are very very smart! Why are you deferring on my question(s)? Enno is indeed very smart but here he provides the data and its up to others to make their own decisions about what it means. For instance, associated gas from the Bakken has always been metered and reported to the NDIC. The NDIC now says that only 15% of the gas from the Bakken is being flared. There are actually very few explanations for increasing GOR other than the declining health of the rock. Eleven wells in the Bakken have produced over 1M BO, that represents 0.0009% of the total Bakken wells in N. Dakota. The median is 150K BO, thus far. 600 wells in Penn. in the AP that might have already made 15 BCF represents about 12% of total wells in Penn. The other 88% are on track to make 5-6BCF, which will not payout unless winter lasts forever in the NE. Water production is increasing in the Bakken. Others have pointed that out. It happens, even in pressure depletion environs. Basic engineering principles that are 100 years old or more can actually be applied to unconventional shale resources quite easily, as can operational observations. There are no big secrets in shale production that only shale producers know. If they knew them so well I suggest they would be out of debt and making money. That is hardly the case. The Permian will be no different than any other shale play, so no, very few wells will make 1M BO. Indeed there are very costly efforts being made to increase IP’s and accelerate IP90-180, but thus far there is NO indication whatsoever that this result in greater UR. If Permian wells are being designed, drilled and completed to create greater NPV thru IP90, etc., so they can quickly be sold, along with the surrounding acreage for absurd prices, including production per flowing BOE, that would be a rather remarkable, risky business model to be trying to implement on the fly. Clayties stuff that just got sold, and the Bass Bros. stuff, is actually just a lot of goat pasture. OPM is what makes it all so beautiful and alluring. So, do you agree with my premise that the Permian shale players are maximizing NPV’s through various ways to extract the money up front to sell out quickly before others find out that the EUR’s are only ~160k as Enno and Brookpe have explained and not the $1 million that PXD and now NBL tout? Mr. Kopel, I understand your question better now, thank you. In other shale plays, most of which are six to eight years old now, there did not appear to be an effort to develop shale reserves, then sell out. The business model for the shale oil development appears to me based almost entirely on reserve growth, even at the expense of profitability. Ultimately that growth model works if a.) prices goes up, not down, and b.) there are willing buyers with more borrowed money to spend. Bros. without discounting, significantly, the “proven” but undeveloped reserves that were reported by the press. If you use Enno’s site to research BOPCO (Bass) wells, they stink!! You may be right, I don’t know. I cannot help but believe that anybody with any cranial capacity whatsoever knows those 1.2M BOE EURS out there are not true. Exaggerating EUR’s now days is like telling fish stories; the fish are all whoppers! It is my understanding that the Permian and Bakken are not shale plays at all but tight silty rock. The laws of physics still apply. This is called “halo oil” because high prices enable worse rock to be economic. As to reserves, some companies adjust the period over which reserves are calculated….I have seen 99 years. This of course requires a decreasing cost per barrel which is duly input also. No relation to reality at all. Not $1 million, but 1 million barrels, sorry! By the way, what do you think of Art Berman’s work on shale and other related oil analysis? I am a big fan of Arthur. He is a geologist and a producer and has a perspective on oil and natural gas production and production economics that only comes from real life and spending your own money. There are several others that post here on shaleprofile.com like Arthur and aren’t afraid to swim against the current. The oil & gas production numbers I report here do include all hydrocarbons produced, including condensate & NGLs. However, I follow the reporting from each state in this regard, and some states deal with this in a different way. Texas does report condensate separately, and I add these numbers to the oil produced. I am not sure exactly how New Mexico deals with condensate, and how both of these states deal with NGLs. I hope someone else here can answer your question in better. 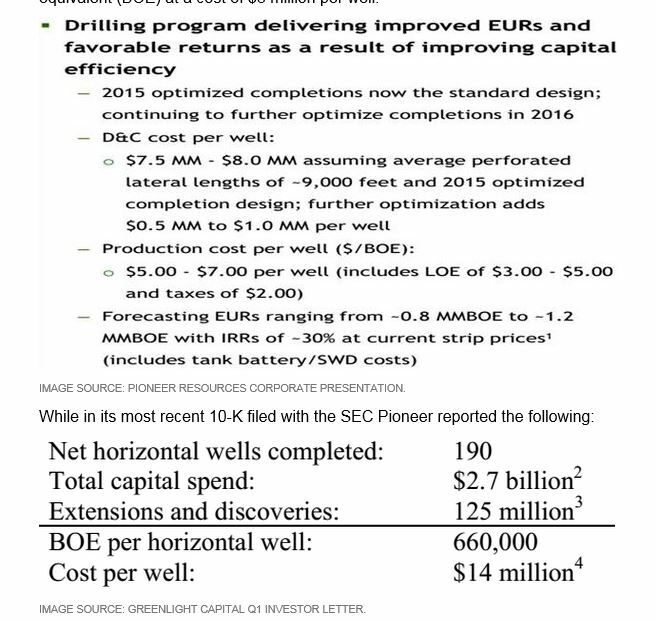 I do not think the numbers include NGLs- but I am doing a summary of PXD reserves and 10ks in order to find the multiplier; since they are a 1 MMBOE EUR driller. The table below summarizes their Netherland Sewell Reserve Report stats. Basically, the effective BOE price is about half the oil price for their product spread, so you can double their oil recovery to come up with BOE. Note their finding cost is about $15 per BOE, which is really about $30 per barrel of oil to a person interested in apples to apples. Their 10-k lease operating expense and and state tax is $11.57 per BOE in 2015. So, their F&D cost and opex is about $27 per BOE, or $54 when looking at what I call “oil unequivalent”. Note that their PW-10 value was $3.2 billion. I think you’ll find their market cap this morning is 10 times this. Jim – interesting stuff: what the bulls would argue is that the reserves are getting cheaper to add each year and that they are getting more oily (e.g. look at your % of reserves that are oil – up from 40% in 2014 to 47% today); though in contrast I think you’ve been generous in looking at total proved reserves. I would look at total costs to add proved developed reserves. Total proved reserve additions will be unnecessarily generous: say Pioneer drills a new well in an area with surrounding proved reserves; that exploration capex generates a new proved developed reserve, and they are able to assume the nearby acreage also has reserves, which they can classify in PUD if they intend to develop it in the next 5 years. But obviously that requires a whole heap of extra capex. So if I make adjustments to eliminate (a) the effect of lower prices on existing reserves and (b) the effect of lower costs on existing reserves, I think they added about 139m boe on a conventional 6-1 basis. If we are being generous, we could say that the reserves are slightly more biased to oil than some of their old positions (say 65%) – so on a price-adjusted basis at 20-1 – they added about 92mboe of new proved developed reserves. Now – their own capex + the amount that Sinochem is paying for them was just under $2.8bn last year. So just on new reserves/production, they are still adding reserves at a cost of $30/(price-adjusted) boe – or still $20/boe on a conventional 6-1 basis. I now realise after typing this that this was a long winded way of getting to the same answer! Greasy- I think you’ll find the undeveloped is only about 76 MMBOE according to Netherland Sewell- which is only 76 wells for old PXD at 1 MMBOE apeice. I think they probably had those done by February, heh? NS must not have been convinced of the PXD development potential at $50 WTI. Wonder what they think of it at $43 (Guess we’ll find out in a couple of weeks)? But the 660 MBOE, given the product mix, is probably a justifiable if a little stretchy number. But look at the well costs! PXD has huge capital upfront for water acquiring and disposal, and even sand and pipelines for oil and gas as well. In their PPT, they clearly stated that they have spent close to $2billion already on water from 2012. They claim that these upfront capital for water will save almost a $1million for each well later. If one says they only drill 190 wells, then each well will cost almost $10million already for water. similarly, back in the days of the Miss Lime fever in Oklahoma, they claim each well only takes $2million to drill and complete. But the cost of water disposal later is $60/barrel, or you have to invest over $5billion for water disposal upfront to cut the cost down to $30/barrel. thanks a lot for this page. Regarding the Permian wells, my impression is that these are horizontal wells. Is that correct? Correct. In all my posts I only include horizontal wells. In the Permian a significant part (even for tight oil) comes from vertical wells, which I don’t include. There is so little in the public domain regarding long term performance behavior anticipated from the Permian. The one thing I can say is that I am very impressed by the original 2010 and 2011 SPE papers which modeled the Bakken- there results are bracketed well within the average EUR reality we observe today. With that said, I digitized the recovery curves from a 2014 Powerpoint Apache Wolfcamp study. Their simulation focused upon the sensitivity of the gas dissolved in solution with the oil on performance for a 23 stage 4 perf cluster frac well. I then overlaid Shale Profile.com actual curves on these theoretical results. 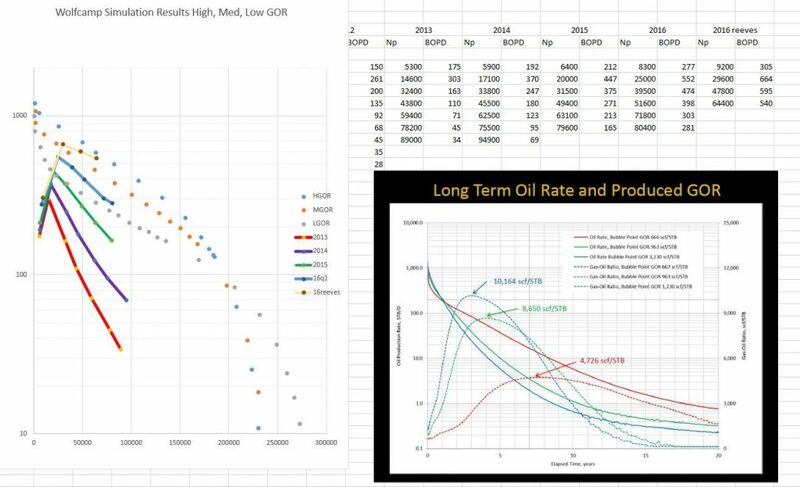 I like the semilog graph of rate versus cumulative oil for these wells, where a harmonic decline is a straight line, and an exponential is concave down. It appears that in the first quarter of 2016, the average Permian well actually “breached” the envelope of a theoretical 220-270 MSTBO well. The 2nd quarter 2016 Reeves County Wells are bumping the ceiling of this envelope.